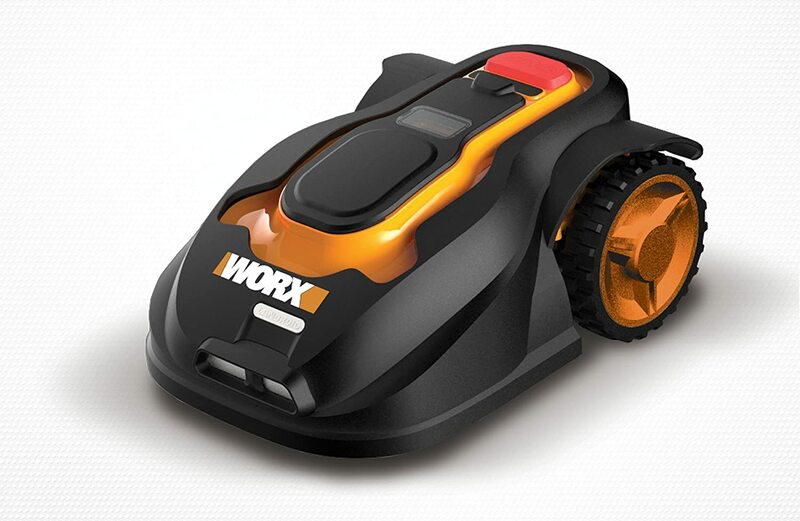 For the best robotic mower, WORX features a top of the line product that you can’t miss. This mower is fully programmable straight from the box for easy-set up and use. It features AIA technology that allows the Landroid to make intricate cuts and navigate through those narrow passage-ways in your lawn. This mower has the capability to evenly mow through hilly terrain, and more specifically inclines and declines of up to 20 degrees. Landroid uses a shock sensor system to avoid obstacles. It automatically returns to its base in case of rain or when the battery has depleted for charging. For its price, it can’t be beaten. You cannot find another mower in its price range that does what this one can do. If you have ever wanted a robot to do your lawn care for you, it’s now a real possibility. The Landroid allows you to customize your hands-free mowing schedule conveniently, even when you aren’t home. This mower operates with Artificial Intelligence Algorithms that can be customized to cut on any schedule including for up to seven days a week. This mower gives your lawn a trim on a routine basis so there is no letting it grow high to cut again. The other great highlight, in addition, cutting your lawn at your convenience, is the minimal noise operation that won’t disturb your neighbors. In addition to its AIA capability for cutting through narrow passages that other robot mowers won’t navigate through, the Landroid has a user-friendly control panel with a fully automated mowing system and programmable timer built in so you can mow your lawn completely at your convenience. The built-in rain sensor allows the mower to shut down during the rain and continue after the grass is dry so you don’t have to readjust the schedule due to weather. The Landroid is also equipped with an anti-theft security system that uses a unique security pin to operate it. Add this to the convenience of customized scheduling and hands-free mowing, and you won’t find another mower as high end like this. In addition to the sleek look of the exterior, the Landroid’s physical design is one that is also efficient. The top part of the mower is actually a protective hard plastic cover for the keypad and controls. It’s easy to lift so you can make adjustments as necessary and change the controls and settings when you need. Everything you need to adjust is in one location. The metal undercarriage is also designed to cut an even path and maintain it’s durability to withstand the daily performance. The large wheels in the back allow for the Landroid to mow efficiently and without hesitation. 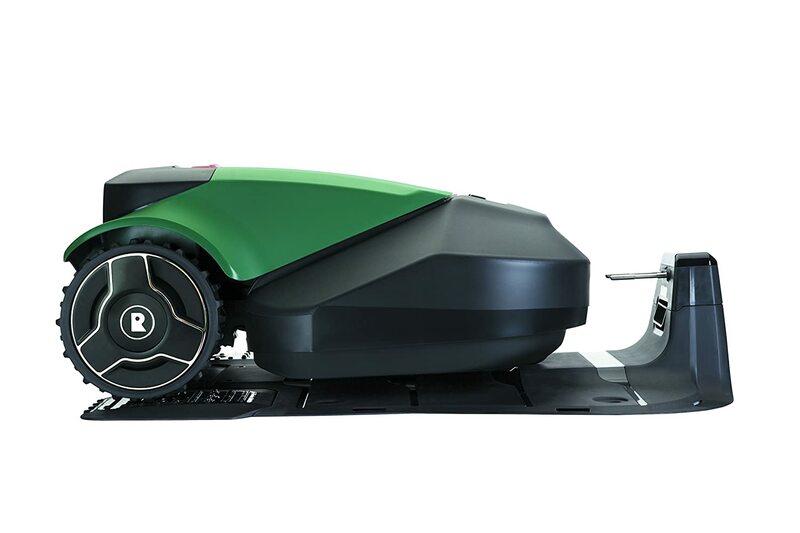 Overall, the design of this robotic mower is top notch. The Robomow RC306 comes with a base station where it stays in between each charge and leaves it only to cut your grass at the determined time. The remote control feature is used for cutting smaller patches of grass that cannot be cut during the automatic operation allowing you to have complete control over the unit at all times. The rain sensor not only detects rain but also high amounts of humidity in the air. Robomow also can handle slopes of up to 35%, unlike most mowers that usually only handle up to 20%. The child lock safety feature helps to prevent unwarranted, and unsafe use of the mower. Overall, this pick is a great choice, based on its great features. 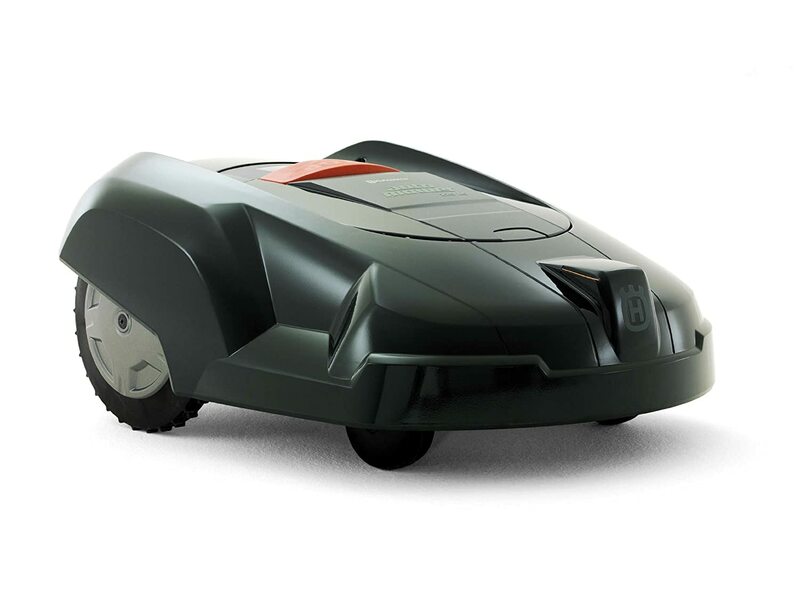 Mower The Robomow RS622 is similar to its counterpart but warrants attention in choosing your next robotic lawn mower. It has a lot of the same features as the RC306, but gives you more control. It allows you to determine how sensitive you want the rain sensor to read. It also can handle a 1% steeper grade than the RC306. You also have more control over mowing multiple zones in your yard compared to just one. The unique safety feature of this model not mentioned in others is that the blade will stop when the unit is lifted from the ground or tilted into a vertical position to prevent unsafe hazards. What is also worth being noted, is this unit also comes with a Child Lock feature to prevent children or others not familiar with the operation of the Robomow from potentially handling it. All in all, if you are looking for a great mower, Robomow is a great brand to look into. The Husqvarna 220AC is yet another fierce competitor based on its powerful performance handling of rough terrain, steep slopes, large and complex area, heavy rain all while still being quiet enough to function at any time of the day. The great thing about robotic mowers is that they are emissions-free and this mower is no different. It operates at a cutting capacity of 1/4 acres and delivers an easy cut. It has three razor-sharp pivoting blades that rotate to cut your lawn evenly and cleanly to deliver healthy results every time. Thanks to the unique design features, this mower is discreet, quiet, and works exactly when you want it to.